On Wednesday night, Twin Cities hipsters went to witness either the experimental art-rock of Iceland’s Sigur Ros at Roy Wilkins Auditorium or the buzzed-about noise-rock of Wales’ Joy Formidable at First Avenue. Music lovers who craved good ole organic American music flocked to see Nashville’s Mavericks at the Pantages Theatre. After a six-year hiatus, the reunited Mavericks have reemerged as the greatest dance band in America. When you can get a theater full of many klutzy middle-aged Minnesotans dancing in rhythm, you must be something special. That’s because the Mavericks’ Latin-infused music makes you move your hips, not necessarily your feet. The Mavericks mine various strains of pre-Beatles rock, including rockabilly, swing, Tex-Mex, lounge jazz and vintage pop. Imagine if Elvis Presley, Buddy Holly and Roy Orbison got their music lessons from Ricky Ricardo. Mavericks maestro and frontman Raul Malo is of Cuban heritage (he grew up in Miami) and that colors the group’s fresh but retro sound. 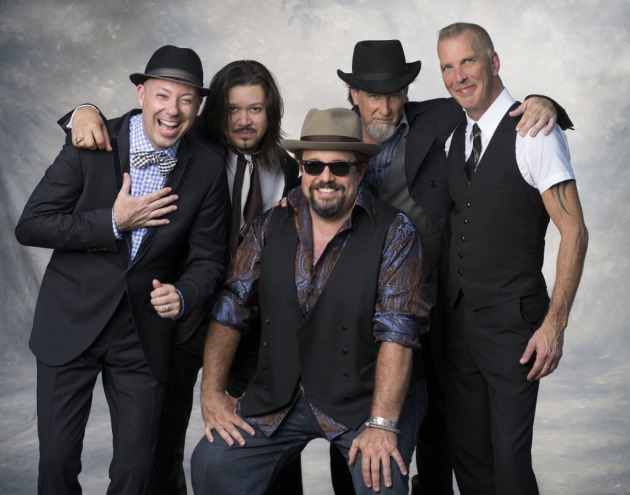 The two-hour performance drew heavily from the Mavericks’ terrific 2013 comeback album, “In Time.” The band played someof these songs last summer at the Minnesota State Fair but both their set length and band personnel have expanded (the nine musicians include trumpeter, saxophonist, accordionist and upright bassist). Keyboardist Jerry Dale McFadden remains a loose-limbed visual catalyst. Guitarist Eddie Perez is flashy in both his playing and his dress (loved the shiny silver suit and rhinestone boots). But the focal point is the magnificent Malo, who looks like a healthy, happy late-period Marlon Brando. Sporting a joyous smile all night long, Malo, 47, knocked out the crowd with a voice that was robust and rich, nuanced and impassioned – as beautifully poperatic as a hybrid of Roy Orbison and Josh Groban could be. Fans would pay to hear him sing the words on the side of a cereal box. In the first hour, the Mavericks were smoking, coming on like a Tex-Mex answer to Bruce Springsteen & the E Street Band. The group received at least three standing ovations before coming back for the first encore, which was so long that it felt more like a second set. After charging through highlight after highlight (including the swing-abilly “There Goes My Heart,” the Righteous Brothers-meet-Chris Isaak “I’ve Got This Feellng” the Elvis-y “O What a Thrill,” the eventually frenzied “Just a Memory,” the jump blues-meets-rockabilly of “As Long As There’s Loving Tonight” and the irresistible “Dance the Night Away”), the Mavericks downshifted a bit. Malo did solo acoustic readings of “Here Comes the Rain” and Patsy Cline’s “Sweet Dreams (of You),” which suggested Buddy Holly as a one-man opera. As if to acknowledge that you can only live in the pre-Beatles era so long, the Mavericks segued from the Cuban standard “Guantanamera” into “Twist and Shout,” a medley that felt like adding too much cheese on your enchiladas. Thankfully, the road-tested tight combo regained its taste with “I Said I Love You,” which sounded like Tom Jones gone Cuban, “Come Unto Me” featuring a Perez and Malo guitar dual, and a revved up treatment of the Mavericks' modest 1996 country hit “All You Ever Do Is Bring Me Down,” one of the most uplifting downer songs of all time. All along, the Mavericks looked like they were having as much fun as the fans. At show’s end, Malo was so elated that he asked for the houselights to be turned on so he could take cellphone photos of the crowd. Bet that didn’t happen at First Avenue or Roy Wilkins.